Arnott’s have been expanding their range of ‘mini’ biscuits, perhaps driven by the glowing review I gave to the Mini Scotch Fingers. There’s quite a few now, so this week we turn our attention to the Mini Jatz. First of all, is there also a mini Savoy? The whole Savoy / Jatz thing intrigues me. 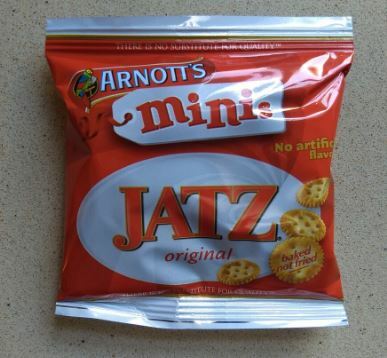 It would be cool to have a selection pack with both mini Savoy and mini Jatz in it. It would facilitate very easy comparison tastings, for example. As it is, we get the mini Jatz in a pack together with Mini Scotch Fingers and Mini Chocolate Chip Cookies. 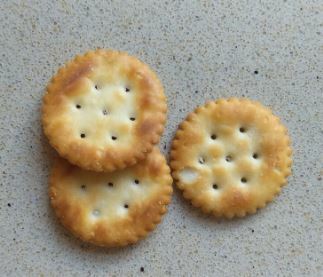 They look, well, like mini version of regular Jatz, They are crispy, salty, and quite moreish. So moreish, in fact, that I ploughed through them forgetting to count the number of biscuits in a pack. There’s enough there for a small snack. But you will want more after you finish them. A solid eight out of ten for this mini contender.